Although I own (2) Canon 5D Mark III's that I shoot with professionally, I just bought a Canon 70D with the 18mm-135mm IS STM lens. The thought of purchasing a 3rd camera body came to me after realizing that I may have to send one of my 5D Mark III's back to Canon for a simple battery terminal issue. As a professional, I cannot show up to a photoshoot with just one camera body which is exactly why I own (2) Mark III's. Although the 5D Mark III just dropped to $2,499 for the body only from a long standing body only price of $3,399, I didn't want to make that level of a purchase, so after seeing images from two of my friends that own the 70D, I decided to look at the 70D as a backup alternative as well as using it for personal use as an on the go camera and video. Not only has all of the online information that I have found really influenced me that the 70D is a solid camera, my own testing and use of the camera has further sold me on it. Although it's not my primary go to camera, it will serve me well as a backup camera, an on the go camera for vacations, etc. and as a video camera. 1) The image quality is very good. I have tested it side by side at 1600 ISO with the 5D Mark III. I am very impressed with the image quality at 1600 ISO and definitely sold on the quality at lower ISO settings. I have a post coming up showing the 1600 ISO comparison. Grant it, 1600 ISO is not a setting to stay on all the time, but it's often a must in low light stage settings. It also makes a difference which lens is used on the camera because at the end of the day, it's not always about the camera body, but the glass (lens) that is attached to the camera body. 2) Although as a professional I shoot with Canon L lenses, there are advantages to the 18-135mm STM lens that came with the camera. A) For video, it's silent for video autofocus. B) The 18-135mm is the equivalent to a 28mm to 216mm focal length because of the crop sensor on the 70D making it a great one lens fits all for vacations and casual shooting. 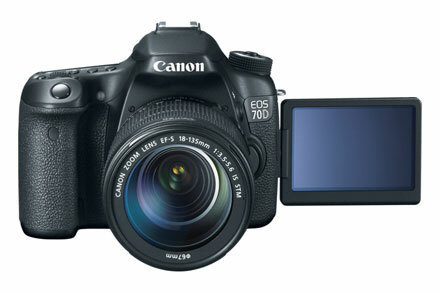 3) Autofocus for video on a DSLR is another feature that I like about the Canon 70D. With the 18-135mm STM lens, the autofocus is silent. I also like the ability to touch the screen and change where the autofocus is placed. That feature allows for some creative flexibility when using shallow depth of field. 4) The flip screen is not something that I am used too because Canon Pro Cameras don't offer that feature. Although I haven't used it yet, I can definitely see how that will come in handy. 5) One advantage to having a crop sensor with a factor of 1.6 is that the Canon 70-200mm f/2.8 lens becomes a 112-320mm lens which allows for a longer zoom range by simply using the 70D instead of the 5D Mark III. I guarantee you without a doubt in certain shooting situations that I can use the 70-200mm L lens on the 70D and you'd be hard pressed to tell me it was shot with the 70D vs. the 5D Mark III. In closing, I am not saying the Canon 70D is a better camera than the Canon 5D Mark III nor am I saying that the Canon 70D is a bad camera by making that statement. I am simply saying that for the money and for certain uses, the Canon 70D is an awesome camera overall. As a professional, I can feel confident grabbing it out of my bag for certain uses. As anyone knows, it's the person behind the camera that makes the difference in the end. When adding an L lens to the 70D body, I will have a tool in my hand to get the job done if necessary.